More than a century after tobacco millionaire Abbot Kinney envisioned and realized in California his Venice of America—a place of romantic canals, quaint cottages, and fanciful, Venetian-styled streetscapes. Its descendent, the present-day Venice, shimmers with energy. Images of vibrant boardwalk, beach, and street life come to mind. However, it is the century-old bungalows and cottages on its remaining canals, quiet lanes, and streets, that are its beating heart. Cottages in the Sun Bungalows of Venice, California features 28 houses that are an iconic collection of small-scale studies in creativity. Having emerged from the neglect and disrepair of the 1950s and 60s, the homes featured have been lovingly reinvented by owners attuned to and engaged by the challenges of small space and intimate community. At times eclectic, charming, whimsical or bold, these extraordinary houses are a testament to passionate love for domestic space and a convincing argument for the virtue os an intuitive, highly personal approach to home design. 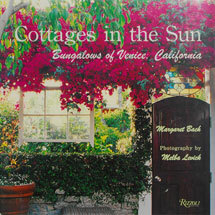 The imaginative interiors and abundant gardens of the cottages and bungalows of Venice sparkle like gems in this multifaceted treasury infused with the light of the California Sun. Their small California bungalow, when built in 1924, fronted on one of the original (and now filled-in) Venice canals. Today, while referencing a time past, the home of Douglas Speidel and Robert Greene exudes a hip, contemporary vibe, with a stylish dose of retro that leaves no question as to the century you are in and the culture you are celebrating: sophisticated, urban, and global. What they were given was a tightly orchestrated series of spaces, featuring a play of cubic volumes that both define rooms and ingeniously accommodate storage. Adding to the spatial interest are ceiling heights that vary by room. All of this is contained within a bungalow with an exceedingly small footprint- only 700 square feet. Inside, they stared by painting all of the walls white, and then began to populate the rooms with a rich and provocative mix of signature contemporary and vintage pieces, many purchased locally at nearby shops and galleries. “My decorative inspiration is Italian Modernism from the ‘60s and ‘70s,” says Greene, an artist whose paintings grace the walls alongside thrift-shop finds and works by friends and colleagues. The result is a disciplined tapestry of fanciful, individual sensibilities. Outside, they started from scratch. After working with landscape architects Jay Griffiths and Russ Cletta to structure the spaces, Speidel planted and detailed every square inch on the tight urban lot to create “wall-to-wall plants”- a thoroughgoing labor of love. He also designed and built the decks that surround the house, as well as the front fence that serves as the new entry. And while privacy is always at the premium in Venice, Speidel is quick to point out that his fence stops at the bungalow’s front windows, thus maintaining the house’s visual connection with the neighborhood. 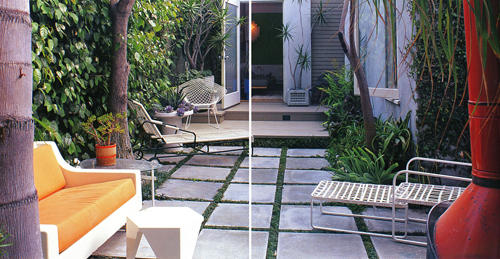 “Ours is a synergistic do-it-yourself collaboration,” says Speidel of the house,” combining Robert’s artistic vision with my pragmatic, hands-on, getting-it-done approach.” While acknowledging the bungalow’s quintessential California features, Greene-who hails from New York City-apartment, what we call a ‘floor-through,’ because when you step outside, you’re in the city.” This time, the city is Venice, a place that embodies everything they value about urban living.